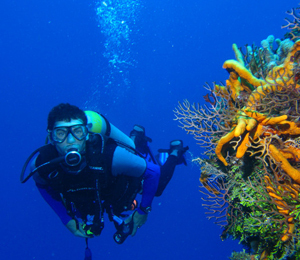 New Providence Island boasts some of the best diving in the Caribbean. The unique rock formations and vibrant coral reefs make the region particularly special for divers looking to observe aquatic life. On this professional and exciting trip into the waters around Nassau, you will have the opportunity to explore premier dive sites and catch sight of stunning tropical fish and other marine organisms. The first dive takes you to a gorgeous underwater cliff. While some wall dives can be deeper, most start at forty feet. You can observe the changes in aquatic life as you examine the wall at different depths. Note the various coral species that attached themselves to the cliff and watch the tropical fish darting around this spectacular formation. The dive-master will offer you the chance to descend to about eighty feet, but you can opt to stay near a shallow ledge if you like. The second dive on your trip can be near a shallow reef system or to a wreck. The reefs around Nassau are teeming with life and provide safe havens for sea turtles, manta rays, and several other large marine species. You can also choose to investigate several wrecks, including a 100-foot freighter and the wrecks featured in James Bond and Jaws. Your dive-master and the boat's crew will help you choose the best diving options based on seasonal changes and weather patterns. Take advantage of the optimal diving conditions in the waters around New Providence Island and join this terrific excursion into the heart of the Caribbean. You won't be able to get enough of the underwater paradise waiting for you off the coast of Nassau. How long are you underwater? Length of time underwater for these dives completely depends on the depth of the dive. You can expect to be under water for 25-40 minutes for dives 40-60 feet and about 35-45 minutes for dives less than 40 feet deep. I have been to the Bahamas many times, but Stuart Cove Two Tank Afternoon Dive is one of my favorite trips! It includes everything that everyone should do here. As a Bahamas veteran, I can say only the best about this experience!